Luxurious villa with beautiful views of the Gulf of Saint Tropez. Entering the villa you will have the spacious kitchen on your left and going though the hallway you will have the living right in front of you. The living is comfortably furnished with several sofas and chairs by the fireplace. There is also a separate seating area created around the Smart TV (no UK channels, but with the possibility of streaming Netflix). From the living area you will have a beautiful view of the garden, the swimming pool and the surrounding hills. The kitchen is spaciuous and modern. It boasts a cooking island and breakfast bar offers a dishwasher, oven, fridge with separate freezer, microwave, hob, coffee machine and kettle. There is a separate room next to the kitchen with a sink and shower. The villa has 4 bedrooms and 4 bathrooms all located on the first floor. All of the bedrooms offer airconditioning. Bedroom 1 is the Master Bedroom with a double bed (180x200) and an en-suite bathroom (shower, bath and toilet). This bedroom has access to a private terrace from where you have a beautiful view. The bedroom 2 and 3 are both equipped with a double bed (160x200) and an en-suite bathroom (shower and toilet). Bedroom 4 is a larger bedroom, it offers two single beds (140x200 and 90x200) and an en-suite bathroom (shower and toilet). The (partly covered) terrace extends over the entire width of the villa. Several seating have been created around the villa. There are 2 luxury butterfly chairs on the terrace. A wonderful place to enjoy the rising sun and a freshly brewed coffee! On the covered terrace, of which you have access through the living, there is a luxurious lounge set. A nice place to relax and read a book. Very nice is the covered terrace adjacent to the kitchen. Here is a dining table with chairs. A summer / outdoor kitchen can not be missed. A nice place in the shade and ideal for breakfast, lunch or dinner. During the evenings this is the place to enjoy a good glass of rosé with a beautiful view of the Gulf of Saint Tropez. The pool is slightly lower than the level of the terrace and can be reached by a few steps. The private swimming pool, 11 x 5 m, is surrounded by a sun terrace with luxurious loungers and parasols. The pool has a depth of 1.20 m to 2.0 m and is equipped with a so-called overflow. The pool can be covered with an automatic hard cover. A good feature regarding the safety of smaller children. It's sun position sun is really very good, you will be able to enjoy the sun all day long. The villa has a beautiful landscaped garden, as well as a lawn whci is nice for the children to play on. There is ample parking on the property. Grimaud is a chic Provencal village. The village is known for its ruins, the castle and the windmill. Definitely worth a visit! 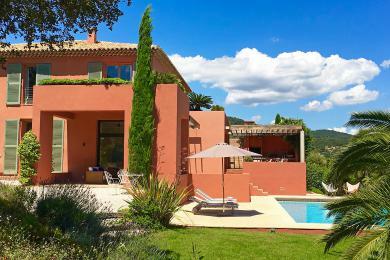 The villa is located in the triangle Grimaud, Saint Tropez and Sainte Maxime. This means that these villages are easily accessible. Every Sunday morning there is a nice antique market just outside the village. Also the proximity to the beach at Port Grimaud is ideal. In Port Grimaud there are various water sports possibilities, such as water skiing and windsurfing. Saint Tropez is about 25 minutes drive from the villa. From small fishing village to cosmopolitan southern French resort. The place where Brigitte Bardot became a world star, thanks to the film Et Dieu Crea la Femme. Saint Tropez - despite its many visitors - should not be missed! Not only because of its beautiful location in the heart of the Gulf of Saint Tropez and its famous harbor, with its luxury yachts. But also because of its cosmopolitan, charming town center with trendy shops, the world famous Le Marché and the swinging nightlife. It happens in Saint Tropez! Within easy driving distance you can find the famous beaches of Pampelonne with exclusive beach clubs. More inland are the picturesque mountain villages Ramatuelle, Grimaud, Gassin, Grimaud and La Garde Freinet. This villa is new within our portfolio. We are very enthusiastic about this beautifully decorated villa. Pool: Private Pool size: 11 x 5 mtr. Pool water treatment: Traditional pool chlorination Depth pool: 1,20 - 2 m.
Pool outdoor shower: Unknown Distance from villa to pool: 5 mtr.